I went to Carl's Junior that situated at Pavilion, KL. 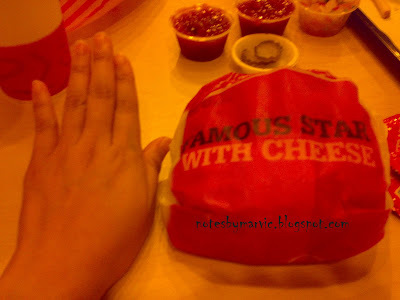 For the 1st time I see a very big burger in my life for real(dah la macam jakun je bila masuk dlm pavilion..hehehehe). I have never eat Carl's Junior burger before. I thought the biggest burger would be Burger King but then Carl's Junior prove me wrong. I ordered their Famous Star with cheese which is superb delicious and big as well. You can see in the picture that even my single hand looks small compared with the burger itself. Started in Los Angeles, 1941, Los Angeles, 1941. Young Carl N. Karcher and his wife, Margaret, make a leap of faith and borrow $311 on their Plymouth automobile, add $15 in savings and purchase a hot dog cart.One cart grows to four, and in less than five years, Carl's Drive-In Barbecue opens with hamburgers on the menu. On his first day in the fast-food business, Carl N. Karcher took in $14.75. More than 60 years and 1,000 restaurants later, Carl's Jr.® has become known as the place to go all across the West for juicy, delicious charbroiled burgers. Today, there are more than 1,100 Carl's Jr.® restaurants worldwide,including one in Pavilion, KL. Do visist and taste your first Carl's Junior burgers at your nearest location and experience it yourself.